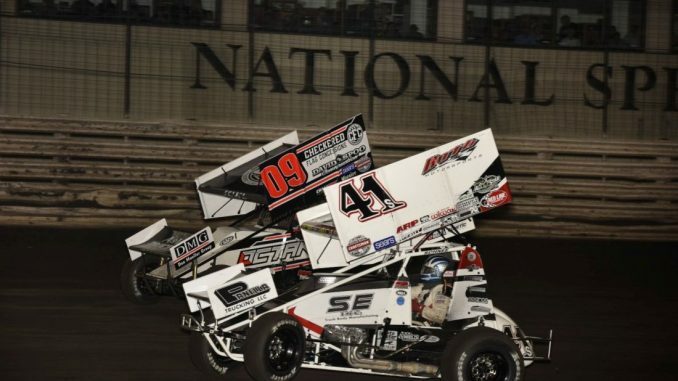 Dominic Scelzi has spent several weekends this season at Knoxville Raceway hoping it would improve his performance at the 5-Hour ENERGY Knoxville Nationals. That work paid off on Friday night winning the SpeedSport World Challenge event and locking himself into Saturday’s Nationals finale. The first attempt to start the World Challenge was halted when Alan Woods contacted the wall in turn two and turned over. Woods exited the car under his own power. After the cleanup Brooke Tatnell took the lead into turn one, but Canadian driver Skylar Gee drove by Tatnell off turn two to take the lead. That was short lived though as Tatnell drove by Gee through turns three and four. On lap three Scelzi pressured Gee to take away the second position with a big slide job in turns one and two. Gee countered by crossing over to the bottom of the track to take the second position back only to have Scelzi drive back into second through turns three and four. By lap seven James McFadden and Austin McCarl came into the picture by taking third and fourth from Gee. Shortly after those passed Tom Harris slowed in turn three to bring out the caution and erase the sizeable lead Tatnell had built up over the rest of the field. Tatnell immediately found himself in a dogfight with Scelzi and McFadden for the lead. Scelzi threw a slide job at Tatnell, which Tatnell countred by crossing over and opened the bottom of the track for McFadden to contend for the lead. By the end of the exchange Scelzi had the lead with McFadden in second and Tatnell dropping to third. Shortly after Tatnell lost the lead he ended up crossed up running the cushion and slid to a stop between turns one and two with most of the field closing in on him to bring out the caution flag. Several drivers had to take evasive action to avoid contact. Tatnell restarted at the tail of the field. After a brief exchange for the lead with McFadden, Scelzi pulled way while McFadden found himself racing Austin McCarl and Tim Kaeding for the second spot. McCarl took second on lap 13 while Kaeding dropped McFadden back to fourth a lap later. Kaeding and McCarl raced for the second spot and slowly started to close in on Scelzi. Kaeding took over second position after McCarl slipped coming off turn two with three laps to go. Scelzi built up a large enough advantage to drive the last three laps without any serious challenges from Kaeding. McCarl, Kerry Madsen, and McFadden rounded out the top five. After having mechanical issues during his qualifying night feature Scelzi bounced back for the biggest moment in his racing career. SpeedSport World Challenge: 1. 41S – Dominic Scelzi, 2. 3 – Tim Kaeding, 3. 2KS – Austin McCarl, 4. 2M – Kerry Madsen, 5. 3H – James McFadden, 6. 41 – Carson Macedo, 7. 99G – Skylar Gee, 8. 55 – Brooke Tatnell, 9. 83 – Cory Eliason, 10. 24 – Terry McCarl, 11. 18 – Ian Madsen, 12. 35 – Jamie Veal, 13. 7C – Scott Bogucki, 14. 84 – Tom Harris, 15. 21K – Thomas Kennedy, 16. 5H – Sammy Walsh, 17. 21AU – Jordyn Brazier, 18. 28AU – Alan Woods.